Spence vs. Garcia - The day after and what next? By Ismail Chunara: Last night in Arlington, Texas at the AT&T Stadium in front of 47,525 screaming fans, Errol Spence Jr (25-0-21) showed us all that he really is ‘the truth’. Most people expected Spence to blow out Mikey Garcia (39-1-30) in a few rounds. I feel the way he won was even more impressive than if he would have knocked out Mikey in the first round. This was so unexpected from Errol. He boxed perfectly landing stiff jabs and power shots to the head and body all night. He used his reach and height to keep the distance and Mikey couldn’t do anything. It was a 12 round shut out and all 3 judges saw it that way. Mikey was just not busy enough. This was a terrible performance from Mikey. He was flat-footed and had no head movement at all. Mikey was almost stopped in round 9, which was Spence’s best round. Spence landed shot after shot upstairs and downstairs and no one would have complained if the fight was halted then. But to Mikey’s credit he showed a tremendous chin in him absorbing some solid power shots from Spence. I don’t want to take anything away from Mikey as he showed great heart, guts and courage by taking this fight. All the credit must go to Errol as he was just too good for Mikey. Mikey definitely is not a welterweight and should look to go back down and fight his mandatory Luke Campbell (21-2-15) who is coming of a recent 5th round KO win and then by some miracle (promotional issues) fight Vasyl Lomachenko in a showdown for Lightweight supremacy. I have to agree with Spence Jr. At this stage of Manny’s career, he doesn’t want to be mixing it with a young beast like Errol. Manny should concentrate on a big money fight with Floyd Mayweather Jr. This would be a more interesting fight with Porter’s constant rough/pressure style of fighting. Both men in their primes however some would say Porters coming of a lackluster performance against Yordenis Ugas and many are saying he was gifted a decision. I feel Porter would raise his game as we saw he was very competitive against Keith ‘one time’ Thurman and beat Danny Garcia. I would have to favor Errol Spence Jr. coming out victorious against Porter. This does leave the Welterweight landscape quite beautifully poised though. As Porter and Pacquiao have shown an interest in fighting Keith Thurman as well. Ultimately all boxing fans want to see and look forward most to the mouth watering clashes between Terrance Crawford, Errol Spence Jr. and Keith Thurman all fighting each other so it is clear who is the number 1 welterweight. I would have to say that Errol Spence is currently the number 1 welterweight in the division. He put on what can only be described as a Clinic, a masterclass and has shown us another string to his bow. He has shown the power and pressure in the past but now he’s shown us the boxing, the movement and that he can masterfully execute the perfect game plan. 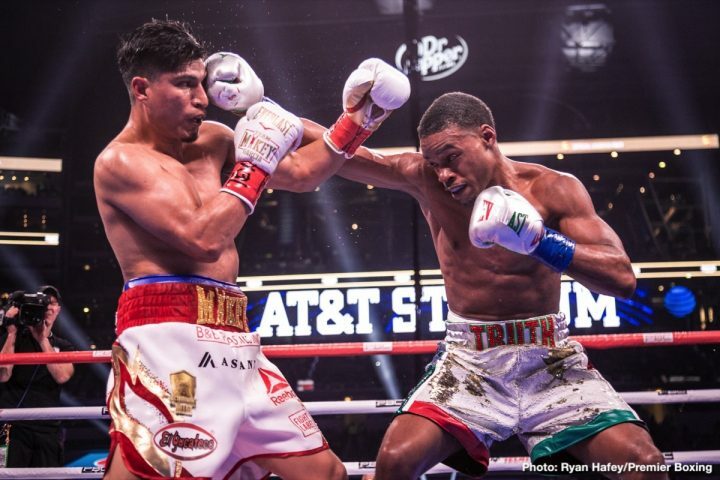 I look forward to seeing what’s next for Errol ‘the truth’ Spence Jr.
Boxing » Errol Spence Jr » Spence vs. Garcia – The day after and what next?